I made it and had little company on the bridge. First none at all which was a little disconcerting as it was only 7PM and usually there are reams of folks. But I made it to Brooklyn and to Tillary Street certainly without seeing another runner. The way back, still no runners, a bicycle (one), feet down, trying to guide his way down the hill. Good luck, I’d walk. I didn’t look back to see if he’d agree with my thinking. By now the snow is stinging my face and coming at a steep angle. Occasionally a large-ish piece of snow/ice comes off the bridge from somewhere up above and lands with a thud. I understand why they might close the bridge to pedestrians. I read later that some unfortunate dude is killed in Central Park by falling branch weighed down by the snow and, as always, realize life can be shortened in the most bizarre and capricious ways. But gear is holding up well (could have used cramp-ons). In the midst of what was becoming a driving snow storm a lone Indian (looking) tourist tries to flag me down to take his picture — err — I passed on the opportunity. 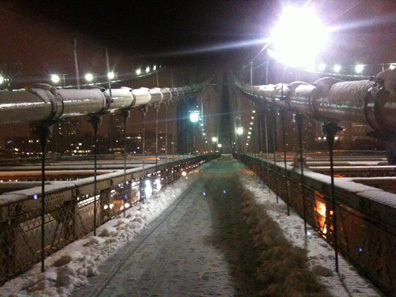 I was “running” the bridge – thought that was obvious, and welcome to New York. I mean c’mon. Wrapped up the iPhone running Runkeeper App in an OtterBox Defender which did its job as well. Personally I just keep the iPhone in a Nathan runners pouch, not purpose-built but works for me. I do three+ miles in the wet snow. Is kinda fun. And as long as I don’t trail water through the apartment wife is fine….I think. This entry was posted by John Pasmore on Thursday, February 25th, 2010 at 9:07 pm	and is filed under New York and tagged with brooklyn bridge, iphone, Marmot, new balance, runkeeper, running. You can follow any responses to this entry through the RSS 2.0 feed. OMG John. Great post, but, please stay indoors!